Mathematical Games, including 'Variant: Limits' the calculus adventure game, Nubble!, Nubble! 64, Nubble! Express and Nubble! Deluxe. (The extended licence includes home use by teachers and pupils) Everyone loves Nubble! - teachers, pupils and parents. It is the perfect way for pupils to sharpen their numeracy skills. We have now developed a new high resolution version of Nubble! 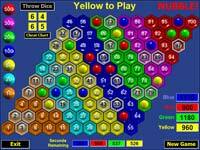 that includes a �Headstart� option in which between 10 and 50 hexagons are randomly covered over at the start of the game. This means that pupils are immediately immersed in the heart of the game and a full game can be completed quickly at the start or the end of a lesson. (The extended licence includes home use by teachers and pupile) Due to popular demand, we have developed NUBBLE! EXPRESS, a new faster version of our compulsive arithmetic game Nubble! The Nubble! Express board is composed of just 25 hexagons. The rules are the same as Nubble!, except that numbers are formed by combining the scores on three (5-sided) dice rather than four (6-sided) dice. A full game of Nubble! Express can be played as a maths lesson starter or plenary. Nubble! Express is also perfect for developing the confidence of less able pupils. (The extended licence includes home use by teachers and pupils) Everyone loves Nubble!, and Nubble! Express is perfect for younger pupils. Now we have developed the perfect Nubble! challenge for intermediate abilities. Nubble! 64 is designed as a stepping stone between Nubble! Express and the full game of Nubble! Everyone loves Nubble! - teachers, pupils and parents. It is the perfect way for pupils to sharpen their numeracy skills. We have now developed a new high resolution version of Nubble! that includes a �Headstart� option in which between 10 and 50 hexagons are randomly covered over at the start of the game. This means that pupils are immediately immersed in the heart of the game and a full game can be completed quickly at the start or the end of a lesson. Due to popular demand, we have developed NUBBLE! EXPRESS, a new faster version of our compulsive arithmetic game Nubble! The Nubble! Express board is composed of just 25 hexagons. The rules are the same as Nubble!, except that numbers are formed by combining the scores on three (5-sided) dice rather than four (6-sided) dice. A full game of Nubble! Express can be played as a maths lesson starter or plenary. Nubble! Express is also perfect for developing the confidence of less able pupils. Everyone loves Nubble!, and Nubble! Express is perfect for younger pupils. Now we have developed the perfect Nubble! challenge for intermediate abilities. Nubble! 64 is designed as a stepping stone between Nubble! Express and the full game of Nubble! A total of 34 items are available. You are currently viewing page 1 of 4.